I was at the launch of this book by Glynn Anderson and John McLaughlin back in November but I didn't get my hands on a copy until recently. I've been drooling over it for a couple of weeks now. A how-to guide. How the producers make cheese, of course, but also how you can make cheese in your kitchen. How to buy cheese (as a consumer or reseller). How to store cheese. How to use cheese. A reference book. All the farmhouse cheesemakers and their cheeses are here, with Top Trumps-style data on each cheese (eg shelf-life and rennet type). A history of dairy production in Ireland. Cheese seems to have appeared from nowhere in Ireland in the last few decades but there are references in historical texts and a milk / butter / cream story in between. A cheese business primer. My favourite part of the book is the biographical detail outlining how each producer came to cheesemaking and how they grew the business. Any small business owner would find this aspect inspiring. A tourist guide. The best way to visit a country is to have a theme and use it as a lever to prise open all sorts of hidden delights. Following the cheese trail is as good a theme as any and it will certainly take you deep into the countryside. Where it's possible to visit, buy cheese at the farm, or even stay on site, this is noted. It can be hard to break into the world of cheese. So much choice, so many kinds, and what do you do with it, anyway? Is it a crime to make a cheese sandwich from a raw milk cheddar? (Whiskey novices are beset by similar uncertainties.) By way of encouragement, there are 30 recipes in the back of the book that use particular varieties of cheese. That should provide the excuse to stride up to the cheese counter to order 150g of Crozier Blue and cadge a taste of one or two others while there. The print quality and photography in this book, by the way, are so good you can practically taste the cheese from the pictures alone. 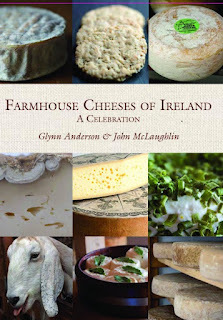 It hardly matters what you already know about Irish cheese, this book can pick up where your knowledge ends. It's truly comprehensive. Except for one thing, and you know what I'm going to say... where is the whiskey and cheese matching chapter?! I asked one of the authors about this and he said they considered a section on pairing with alcohol but they had to draw the line somewhere. The book is already quite hefty enough, it's true. This would have been a good use for the book's website though - the "DVD extras", if you like. But I do believe that the combination of Irish whiskey and Irish cheese is so spectacular that it warrants a few pages in the printed edition. In its absence, you can find some suggested whiskey pairings on this site. Whether you take your cheese with or without whiskey though, you won't want for a better guide to the curd world than this book. It's published by The Collins Press at a RRP of €24.99.